f you are planning to sleep somewhere other than your home then beware because bed bugs love motels or hotels, and unfortunately they may follow you home. If you are bitten by a bed bug than it can cause severe itching and a welt like a bite. Don’t worry though, because there are many ways to avoid getting bitten. First of all, it’s a good idea to check and read reviews on the hotel before booking a room. Bed bugs are found in beds but most commonly found in the bathroom of hotels, so make sure that you check there before anywhere else. 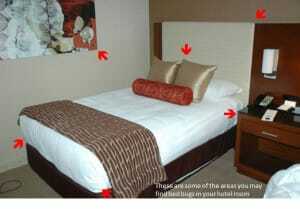 Also to thoroughly check the bed, pull back the linens and search under the mattress and behind the headboard. They look like small dots or small blood stains. Bed bugs also come from groups so if you find one that means there are more. It is also a good idea to search around the bed, like under the telephone, inside of books, or anywhere within 15 feet of the bed. Make sure that you check at night because bed bugs are nocturnal and you will not see them in the daytime.